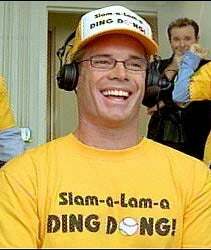 Not getting enough Joe Buck? Don't worry: There's a possibility he might be coming to a late-night talk show near you. He has already filmed the pilot, and FOX might be considering adding it in 2009. Fox is considering a weekly, half-hour late-night show hosted by its lead sports personality. The network's entertainment division just quietly completed a pilot for the show in New York. The format currently under consideration would include both interviews and comedy and be set in front of a small studio audience. We don't dislike Buck as much as many of you do, though it's possibly that's just the St. Louis thing talking. But we're not sure he's quite limber enough to pull off a late-night gig. But he's gotta be better than Magic Johnson, right?